The winners picture at the North American Woodcock Championship on 9/16/2018. Yesterday in McAdam, New Brunswick Wild Apple Calvados won the North American Woodcock Championship. 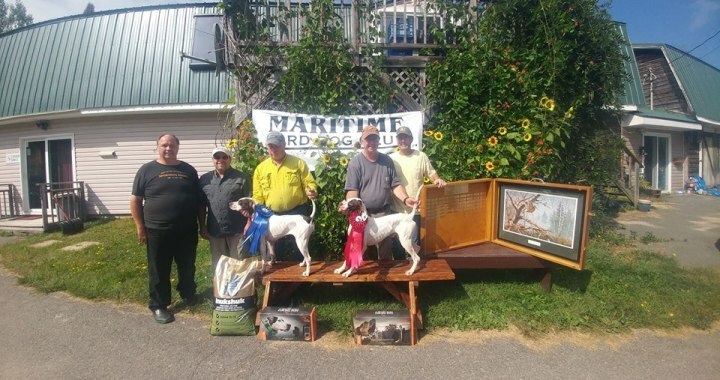 For Brandy this her second Championship as she also won the Northeastern Grouse and Woodcock Championship in the fall of 2016. Her performance yesterday was one we can be proud of. 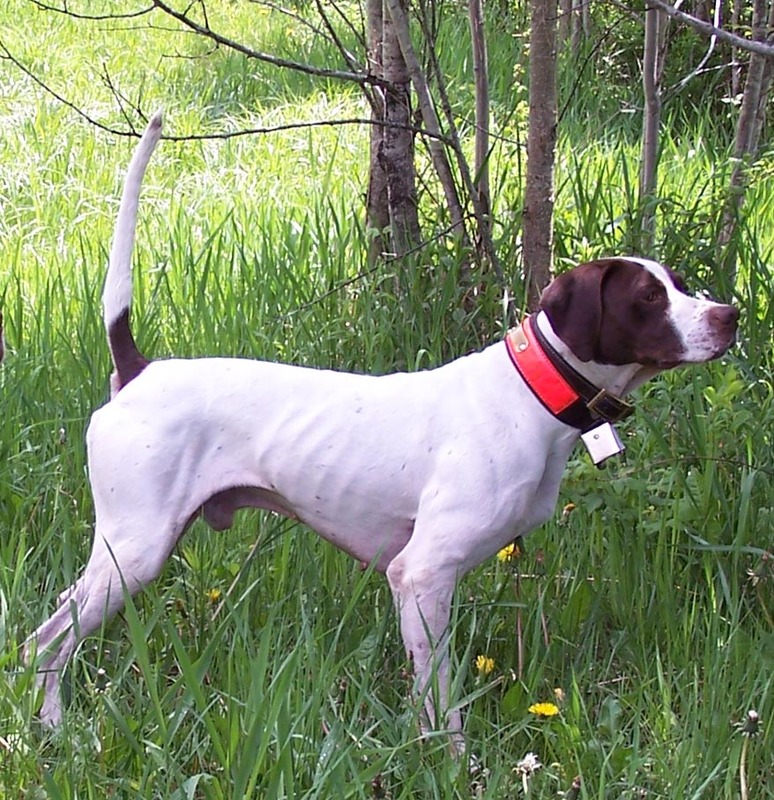 Conditions were hot and dry in the woods of New Brunswick and many dogs could not connect on a bird. Brandy ran in the second brace Sunday morning and ran hard hunting all the likely looking cover. With about five minutes left her bell stopped well of to the right of the course. Judge Bill Bonetti and I went looking with Scout Steve Forrest and trial chairman Bob Little assisting. Often the dogs are further away then we think when they stop so I kept following what I thought was a good line and the spotted Brandy standing just in the woods on the side fo a small clearing. When I got to here, a woodcock lifted and a fired. Bill looked at his watch and said there was 30 seconds left. I collared Brandy and watered her which used the remaining time. The Runner-up came in the next brace when Bob Little scored two finds with Caird’s Lefty. Wild Apple Calvados is by 7X champion, Grand National Grouse Champion Autumn Moon out of Cover Dog Covergirl both Ace and Covergirl were sired by Wynot Ace who goes back to Elhew Snakefoot through Elhew No Trump and Elhew Fibber McGee Autumn Moon was a littermate to Wild Apple Jack and they were out of Elhew Liebotschaner who was by Fibber. Covergirl has her own Elhew blue blood on her dam’s side as well. She was out of Four River Covergirl that was Elhew Sinbad X Miss Elhew Awesome. When Bred to Elhew Black Dose Brandy produced a really nice litter born the last day of March 2017. With only a handful of derby stakes so far this fall all four of the Dose X Brandy that have been entered in trials have open derby placements. 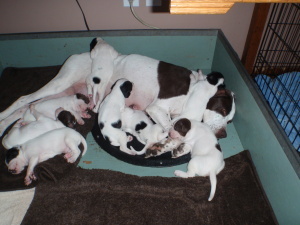 Brandy and her puppies in the spring of 2017.